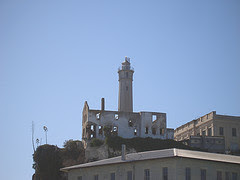 While I have not been to Alcatraz, I do really want to go on a tour and know that I will one of these days. I'm especially intrigued by going on a nigh tour around Halloween, since Alcatraz is purported to be haunted. What can I say, I'm a fan of Ghost Hunters. Anyway, I've passed Alcatraz on the two bay cruises I've been on and have taken a number of pictures. Obviously, the view one has from a boat is not the same as what one sees while on the island. Some of the interesting sites you can see from the bay is graffiti left over from the Native American occupation that started in late 1969. Other interesting sites are signs warning you from picking up "hitchhikers." While the island itself is part of the National Park Service and charges no entrance fee, the only way you can get to the island is via the official ferry service, which does cost. Depending on which tour you take, the cost varies from $26.00 on up. The most complete tour appears to be the evening tour for which reservations are definitely recommended, since this tour is only offered from Thursday to Monday. The other tours are offered daily. The ferry for Alcatraz departs from the Hornblower Alcatraz Landing at Pier 33. If you do go to Alcatraz, make sure you have comfortable shoes, because there is a lot of walking once you disembark from the ferry.